You’ve probably figured out by now that I like switching things up. 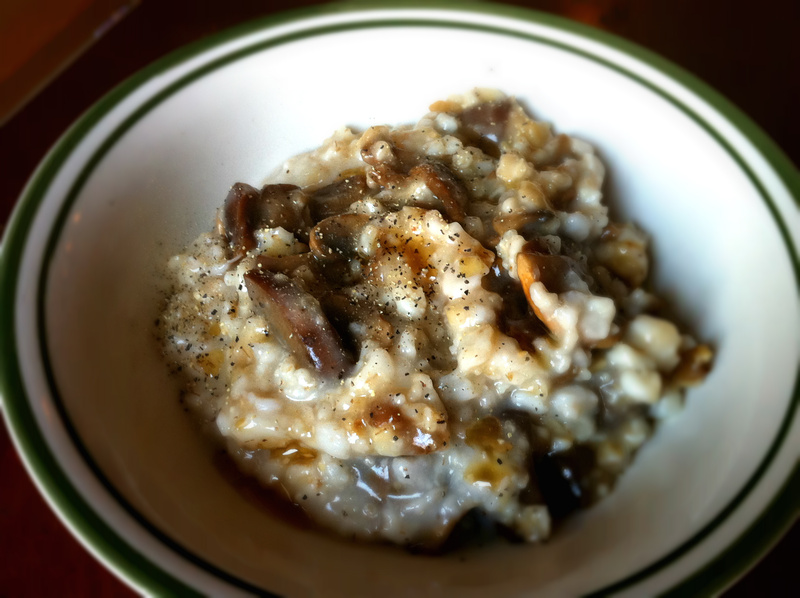 So when the idea came to me to rethink one of my breakfast favorites — oatmeal — I jumped on it. Literally. And I instantly regretted it. What? You might ask. What is this madness? But think about it. Sometimes you wake up and don’t want sugary toast, sweet berries, or even syrup-n-waffles. Yep, crazy mornings like those do exist. You wake up and you want something savory, something filling and satisfying, something umami and sizzling and salty. Something comfortable and warm like oatmeal. But… savory. This is a Chinese-inspired dish, inspired by warm bowls of rice porridge and mixed with salty vegetables — a delicious breakfast classic. Feel free to add in any type of food your early morning heart desires: sausages, bacon, cheese, green onions, literally anything but the kitchen sink. Because apparently steel-cut oats has nothing to do with stainless steel. For that extra something somethin’, I love to top it off with a quick dash of sesame seed oil and a sprinkling of parsley and freshly ground pepper. It’s positively irresistible. Don’t even try. What’s your favorite breakfast dish? I’m going to give this savory oatmeal a try. Sounds delicious! This is great! I have never tried Asian flavours with oatmeal, looks amazing!! I must tell you though, savoury oatmeal is very common in India! Quakers even makes ready to cook savoury oatmeal!!! Wow, nice to know! Oatmeal is an amazing food, both savory and sweet! I guess this is no different than having breakfast grits and dinner grits! I like your recipe! Thank you! 🙂 Yes, I love grits too!! My favorite beakfast is Farm Style Eggs like my Grandmother used to make: two scrambled eggs with cooked hash browns, sausage, bacon, minced onion, chopped bell pepper, and chunks of cheddar cheese mixed in topped with ketchup and served with a pair of fresh buttermilk biscuits slathered with real butter. I don’t have it too often as it is a real calorie bomb! That’s awesome! Good old farm style breakfasts are the best!! It’s basically the only reason I go to mom-and-pop diners, ha.